Although his name has been synonymous for some time with Detroit and more particularly the quality strains of house and techno emitted by the Spectral Sound label, some will be surprised that Ryan Elliott’s recent EP for Ostgut-Ton is his first proper release. Having previously turned out a few edits and remixes, even appearing with his own original track “Abatis” on the Ostgut compilation Fünf, Elliott’s main area of focus has been as A&R man for Spectral Sound and as DJ ambassador for the Detroit based label. With a reputation for impeccable DJ sets and a demanding schedule, Elliott left Detroit for its European simpatico city of Berlin eighteen months ago, finding a surrogate home in the fold of the Ostgut crew. LWE got on the line to Elliott to discuss the importance of developing yourself as an artist, the dangers of juggling a hectic DJ schedule with a full time job, and upholding the legacy of the Motor City. 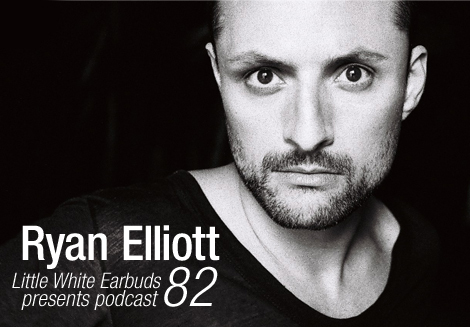 Showing just why he is such a coveted name to have on your club bill, Elliott also supplied our exclusive 82nd LWE podcast, a hot mix of raw, bristling techno that encompasses the works of his contemporaries, unreleased tracks and some vintage moments in techno. So you grew up in Detroit right? Ryan Elliott: Correct. I grew up on the west side of Detroit and I lived there my whole life until a year and a half ago when I moved to Berlin. I mean I went to university in a small town half way between Detroit and Chicago called Kalamazoo, but that’s still kind of Detroit. So growing up there I guess you discovered electronic music at a fairly young age. Yeah I mean I guess the perfect kind of answer for this interview would be that I first went to the Music Institute when I was twelve years old and then went to Richie’s Plastikman parties… but I didn’t. I discovered it from the radio. Even still today they have the “Drive at Five” show and they’ll do a live DJ mix on the radio and they are sprinkled with hip hop, booty, electro — like proper old school electro, and Detroit techno. So I was introduced to the first Submerge records through the radio… and I forgot how strange it is to hear a live mix on the radio. When I went home for Christmas and was driving from one family member’s house to another and “Nights of the Jaguar” came on the radio and I was just thinking there’s no other place where you’d get that playing on commercial radio. So is Detroit really known for championing its own music? When you were starting to get into DJing and production did you feel like there was some sort of Detroit legacy you needed to uphold? Yeah, for sure, and even now at over 80% of the shows I play someone comes up to me and says, “Oh you’re from Detroit huh,” because they know of all the associations that entails. I mean, I’m no Derrick May but yeah I do definitely feel that I have to uphold that legacy and fly the flag for Detroit. So back in the day you’d get people like Derrick or Mike Banks mentoring people as they came up. Does that sort of thing happen today? Or did you get some yourself? Well I came up with Matthew Dear so he was always a very good mentor to me. I don’t know Theo and those guys as well but I do think there has been some mentoring between him and Alex [Omar-S]. I mean, Detroit is not a posh city at all so there is very much a feeling of helping each other, you know, like we’re in this together, let’s stick together and help each other any way we can. I think that comes through with the production as well, with people lending each other gear and that sort of thing. So how did you start out with Spectral Sound? That’s a funny story. I never really got into DJing until I came back from university; I’ve always been a late bloomer in life with everything. So I started going out to clubs more and it was a natural progression. I became interested in what the DJs were doing, started trainspotting and all that. So my friends and I were living together and we bought some decks and learned to beat-match and all of that. Then a friend of mine from high school worked at this bar and they wanted to start an “electronic night,” so he suggested me because he knew I DJed. So I went and gave them a CD and they asked me to come in and try it out for a while. On the first night I played Matt [Dear] came in and said, “Hey I’m a DJ too, I really like what you played, can I come play with you next week?” and there was never a second thought about having him come do it with me. So that’s how it started and we did every Tuesday for about four years. It wasn’t just doing it, it was taking our own decks in and all that, they just had the sound system. So by the end of it he was touring more and I was starting to do a bit so I would play on my own or we’d get someone else to sub in for both of us. Then through meeting Matt I met Sam [Valenti] who owns both Ghostly International and Spectral Sound, so I eventually met the whole crew. And you know when you meet certain people and you just instantly gel and it’s like they’ve instantly close friends, it was like that. So what year was it that you started that residency? That must have been 2001. And from the get-go were you interested in making tracks? No, not at all. I wasn’t interested in making records for a long time actually. For me everything happens very slowly. So once I started buying records and then DJing, after a long time I started doing the odd edit or two. Then maybe a remix that wasn’t even released and then slowly it progressed into production. But you know, I think I’ll always consider myself a DJ first. Yeah it’s interesting, I mean despite seeing your name for quite a while, that your recent Ostgut Ton release was your first proper twelve. Yeah that’s my first ever EP. I’ve been flying around the world DJing for about ten years now but I have to say I was really proud to actually see my record on the wall in DJ shops. I actually have a funny story. I always shop at Hard Wax and Rotation here in Berlin every week– it’s part of my routine. I was listening to records in Rotation and this young guy comes in and he’s picking records off the wall and I got all excited because he picked my record. I was all like, “here we go, he’s going to listen to it” and he puts it in his stack and he listens to everything and then he put it back and didn’t buy it. So within five minutes I was all excited because he’d chosen to listen to my record then all bummed out because he didn’t buy it. [laughs] It’s funny because I mean it’s selling well and I’ve gotten good feedback on it but this really bummed me out for a couple minutes. Then after I walked out of the store I have a laugh about it. I mean life is good, I have nothing to complain about. You know it’s pretty rare that you have been DJing around for the past ten years or so and have only recently been producing as well. For a long time now it’s been near impossible to have a DJ career without being a producer too. Yeah and I’ve said it before, that for a while [the way I got gigs] was through playing with Matt when he would go tour, and I have no qualms about admitting that. But my thing was, if that was the case I had to show the promoter that I was a really good DJ so I would get booked again. But yeah, I was also very lucky that my first ever international gig was at Fabric. And Judy from Fabric has always been very nice and so have the guys from Berghain — for whatever reason a few of these really big clubs around the world took an interest in me very early on and I’ll never forget that. I was very lucky for that, so when that happens you have to make sure that you show up and you let them know that they did the right thing by booking you. Did you ever have any career ambitions outside of DJing? Yeah I worked for one of the big three auto-makers in Detroit for ten years. I was a financial analyst, a currency trader. I only left that job when I moved to Berlin. I mean I started there when I started doing that residency with Matthew, so as my job started getting more involved, so I was also getting more into DJing and following that side of things. But yeah it got hard to keep my mind on the jobby job, especially as it involved a lot of math, so Monday’s were never my favorite day. But I have lots of funny stories about those times. I think the worst it ever got was I worked late on a Thursday, then flew first thing on Friday to Tokyo, played there on Saturday night, then straight back and went to work on Monday morning. All of that and only plane sleep — if that even counts for anything. Did you ever get called out by the boss and told to chose which path you wanted to go down? No, I mean they were actually very understanding about the music. They knew that was my first love, but also I was good at my job and always did a good job for them so they tolerated the other side. But I mean, at the end I felt bad because I’m not a good multi-tasker so it was definitely time to go. What was it that made you leave Detroit? Well I was playing in Europe so much that it just seemed logical to do it. And my parents even said to me that I should do it, that they wished they had the chance to chase their dreams like that. I had never lived outside of Detroit and Berlin felt so similar to Detroit too. I also had such a good relationship with the Ostgut guys too, so although making everything happen and actually moving was hard, the decision to do it was easy. Just getting back to Spectral for a moment, how did you ge into the A&R role with them? Matthew and I split the role, and I guess it was because we were the ones who were buying records each week and the ones getting promos from other people who were maybe opening for us and things like that. We were the ones in the trenches so it just seemed like the easiest thing. How broad or specific has the vision been for the label? The same as Ghostly really, it’s very broad. We have things like acid from James Cotton, or then Todd Osborne who is pretty hard to categorize. Then people like Subb-An who has just done a really great record for us, who is kind of new school. I would say the only thing we really make a priority is that it must work for a DJ, it has to be geared for the dance floor. We always just know when something comes in whether it’s something for us or not. Electronic labels take a very different approach with their artists than the majors do, but if perhaps you took a newer artist on are there instances where you will help that person develop their sound and their career? Yeah, of course. I mean, we have a core family but if we receive a demo from someone who really blows my hair back then we take them on and if they keep coming up with great releases they become part of the core family. So are you still in that role? Yeah, the role hasn’t changed; Matt and I still do that. So what is your relationship with Ostgut? Well I’m a recording artist for them and they handle my DJ bookings. I hold a monthly residency either at Panorama Bar or Berghain depending on the month, it changes. OK, you also did the mix of the Fünf comp too? It does seem like many people in that Berlin scene is definitely into the music for all the right reasons. Playing at Panorama Bar and Berghain, I always take my DJing very seriously. I mean, I told you, I always record shop every week, sometimes twice a week, but when you know that you’re going to come into Panorama Bar on Sunday, you know that probably half of the crowd is just there to lose themselves and have fun, but the other half are probably all DJs or promoters and they know the records you’re playing. So it really makes you up your game because you know you’re playing to all these people, so it makes me strive to be a better DJ. Back to your EP for a second, were you approaching it at all from the point of you also being an A&R? Like thinking, OK, these are the things I would be looking out for, I know there should be this and this and this in it to be more appealing and that sort of thing? No, any time I sit down to produce now — and maybe this will change when I become a more accomplished producer — but right now the way I approach production is with my DJing experience, what works best on the floor. These subtle bass shifts, these ins and outs of certain sounds that I know just always work, that’s what I’m trying to recreate and capture. So really with my productions right now, I’m not interested in adding twenty elements of something. If you can add four or five or six really good elements and you can sequence those in a clever and interesting way then that’s all you really need. My biggest influences are Hood, Mills, the old Studio 1 records, Baby Ford, people like that. You don’t need a lot when it’s that good. Don’t get me wrong, I’m not comparing myself to those guys, but those are the only elements you need to rock a dance floor. It’s not rocket science. Wolfgang Voigt is an absolute master. You can rattle off ten different genres and he’s at the top of the game. His Red Bull lecture he did was so good, they’re a great resource for anyone who needs inspiration. But he was saying that in his lecture, that you can make the most amazing track from about four different sounds, if it’s done well enough. So how much are you devoting to production right now? Well I’m DJing every weekend and I try to take Monday as a rest day, but Tuesday through Thursday I’m at it in the studio. I’m just sprinkling the last little bits of pixie dust on to my debut EP for Spectral, which will come out this summer, so I will keep the ball rolling. Do you feel like once you enter that realm of releasing you have to keep it up and keep your name out there? No, I don’t. I don’t think an artist should create that way. A painter should paint when they feel like painting. If a painter paints because they need money then they’re not really a painter. It’s finally struck me that I can actually produce — and in the past I have wondered whether I would be adding anything, but I think I can now and I think this can continue. But if there’s ever a patch where I have to force it, then I’ll go back to doing something else. Production-wise I very much want to stay as an artist. The mix was recorded in a studio in Berlin using two Technics, two CDJs, and a looper — my normal DJ set up. It was done in one live take, to get a nice feel and flow, and then pulled into some sound editing software to do a few edits and add a couple of effects. Now that I think about it, the mix was recorded in the exact opposite environment of a club setting (alone, middle of the afternoon, in sun filled and clean studio), but still does very much represent one of my current sets. I play anywhere from deep house to tough techno, depending on the show. This mix definitely lands more on the techno side, but also isn’t too banging because I realize most people are listening to podcasts while they work during the day, on their iPod while doing their daily commute or exercising, or in a car. Content wise, it’s simply what’s in my bag at the moment. I always play a mix of old, new, and to be released stuff in my sets. I’m totally back into all my old late ’90s/early ’00s techno, so you’ll hear User and Killabite towards the end of the mix. EQD, Mills, Rolando, Skudge, and DVS1 can do no wrong in my book, so they represent some of the current tracks. I also want to mention a new act that I’m super excited about called The Express. I’ve featured two tracks from them in the mix that will be forthcoming on their own HEM label. Keep an eye on these guys as they have loads of excellent material coming soon. I hope everyone enjoys the mix as much as I did making it. You’ve partly answered this already but what can we expect from Ryan Elliott in the next year? Yeah, well the EP for sure and then more production. And really I’m sort of gearing up for the summer because that’s a big time for the DJ. So I’m just loading up my techno gun full of tasty bullets [laughs] to unleash on the dance floor. Techno soldiers, that’s my motto. I’m not into techno but this is such a good mix, so balanced! the rio padice track is called “mission to mars” not mission to venus. Nice interview !! And Mix !! Nice interview, really encourage me for some thing and action. what track samples “can you party” by royal house??? it’s at 38:00 minutes + ??? SORRy _ i meant at 41:00. what track samples ROYAL HOUSE – CAN U PARTY at 41:00??? Contakt – Not forgotten (Rolando remix) !!! Thank you for including this track in your mix Ryan. Awesome mix! Big thumbs up! That’s where I’m at right now as I’m listening to the mix and it is flowing so GREAT! The Express no 1 with Bost and Host +2 more is now out for presale on word and sound. HEM is the label! Nice one RYAN!! Thanks for the love..